For a suburban village, Cheam has had a particularly thrilling past – graced by royalty, engulfed in scandal, and continually reinventing itself to remain in step with the zeitgeist. 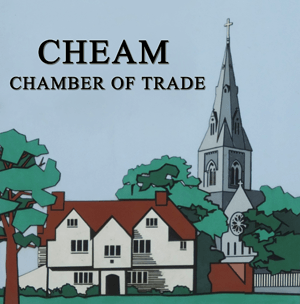 Cheam was featured in the Domesday Book, dating back to at least 1018. In the middle ages, the area was renowned for its potteries, and later on, for its breweries and connections with King Henry VIII. His magnificent Nonsuch Palace used to dominate the area, until it was handed over to a racy mistress of Charles II – who had it pulled down to cover her gambling debts. Cheam went back to being to being a small, sleepy rural community, until rapid expansion in the 1920s and 30s transformed the area into a prosperous, modern village that is sometimes used to exemplify the suburban dream. Now, most people are familiar with the area through a variety of cultural references that play on that image. In most seasons of the comedy series Hancock’s Half Hour, Tony Hancock lived in Railway Cuttings, in fictional East Cheam. The streets often feature on TV, as backdrops for programmes including Terry and June, and The Bill.